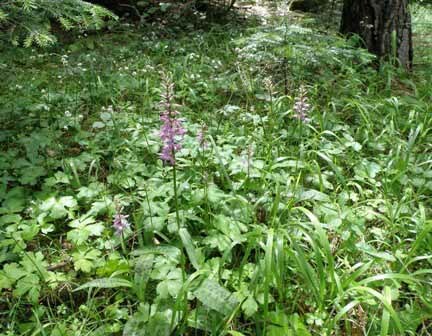 This orchid is a common sight on the roadsides in the Pirin Mountains National Park in Bulgaria. It is a tall orchid - sometimes growing up to 90 cm in height - and fairly robust with a flower-spike that is rather lax in appearance. At first conical, the flower spike becomes much more cylindrical as the flowers open fully. The leaves are sometimes spotted, as can be seen in the specimen above. The flowers vary between dark and much paler pink, and the lower lip of the flower has a very elongated central lobe. Both the sepals and the petals are spotted or have 'loop' markings of a very dark pink or almost red. Dactylorhiza saccifera is widespread but not always common; it occurs in the Balkans and in Bulgaria, Algeria, Turkey, Greece and generally throughout the central and eastern Mediterranean region. 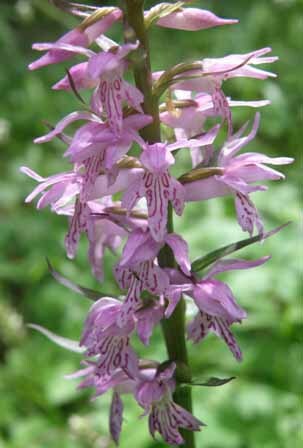 Dactylorhiza saccifera blooms either in full sun or in partially shaded grassy places, and it can be found in the edges of woodland, in woodland clearings and, very commonly, on roadside verges. This orchid flowers from May until well into July. The specimen above was photographed in the Pirin Mountains of Bulgaria in mid June.